Water damage is devastating. Your carpets, your walls and even the structure of your home can be at risk, particularly if part of your home is submerged in water. Unfortunately, the problem won’t go away on its own, and you can’t afford to wait; you need to act fast in order to preserve your home and your belongings. Houston residents can call 713-595-0431 during any water emergency. 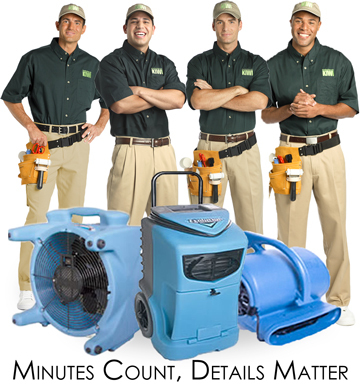 Our 24-hour Houston water damage hotline is always manned. When you call us, we’ll gather our team of professionals at any time, day or night, to ensure that you and your family don’t lose it all. We’re bonded, licensed and insured; we’re also certified by the Institute of Inspection, Cleaning and Restoration to handle all aspects of water and flood restoration in Houston. KIWI’s 24-hour emergency dispatch service ensures that you don’t have to worry about waiting until morning if an overnight flood occurs. We’ll even work with your insurance company to handle billing so you don’t have to worry about paperwork or other details; you’ll be free to focus on your family. Water damage from a flood can bring in contaminants that threaten your family’s health. Our expert teams can tell you if there are hazardous materials, such as those from sewer lines or wastewater runoff, and we’ll be able to tell you whether it’s safe. We’ll even remove your personal belongings, including rugs, furnishings and other items, to store them in a safe, dry place and perform any necessary cleaning or sanitizing work. The first thing our team of experts will do upon arriving at your home is use our industrial-strength water extraction tools to remove all of the standing water quickly, safely and effectively. We’ll draw out the moisture using pumps, blowers and dehumidifiers so that we can continue to the next steps: sanitizing and deodorizing your space. Because we’re completely committed to your satisfaction, we give you our famous one-year guarantee on all water damage and flood restoration services we perform. We’ve helped people all over Houston and in the rest of the country recover after water damage. 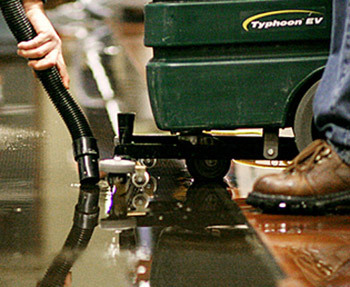 One of our largest water damage restoration services was right after Hurricane Ike. We aided in the restoration of thousands of homes for months following the hurricane. People are extremely satisfied with what we’ve done; just read what they’re saying about KIWI Services. 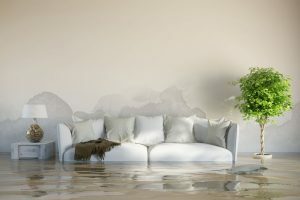 If your home has been water-damaged due to a flood, a broken water pipe or an overflowing bathtub, toilet or sink (or anything else, for that matter), call the Houston water damage restoration experts. We’re always standing by, waiting to help. We answer the hotline all day, every day, even on holidays. Call 713-595-0431 any time, day or night. We’ll dispatch a team immediately so that you can get the help you and your family deserve.